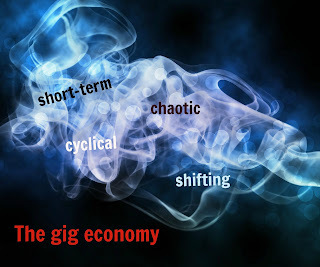 "Gig" is the word best describing the economy we work in now. For workers in the "gig" economy, one must learn to whirl in drastically changing business models. To see our professional work as a single engagement with a day to day timeline is a healthy posture in the gig economy. Each one of us is susceptible to being let go at a moment's notice. If you resist seeing this reality of shifting work, your sense of identity and confidence will take a lot of unnecessary jabs. To see work as a gig is especially important because we can't attach our confidence to one employer or think we will work in the same position indefinitely. What would it look like if we all began to view future work as a short term "gig"?